This app is great for the iPad. Turn it on and put on your desk. 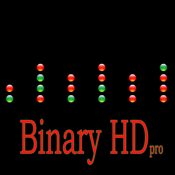 The perfect app for the IT nerds who speak binary. Pro features are 100% ad free and include the use of any orientation.